Looks like this is going to end up being a craft sharing thread. And so, moved to the craft sharing subforum. Panther is perfectly fine. 'As much fuel as you can carry' is a good recommendation, but the afterburning is not. Without it, and decent TWR, you can sustain Mach ~2 flight (~600m/s) surprisingly economically, if you are sufficiently streamlined. And remember, in KSP, 'streamlined' means there are no open attachment nodes, as few surface-attached things as possible outside of cargo bays, and everything ends in pointy things, both front and back. 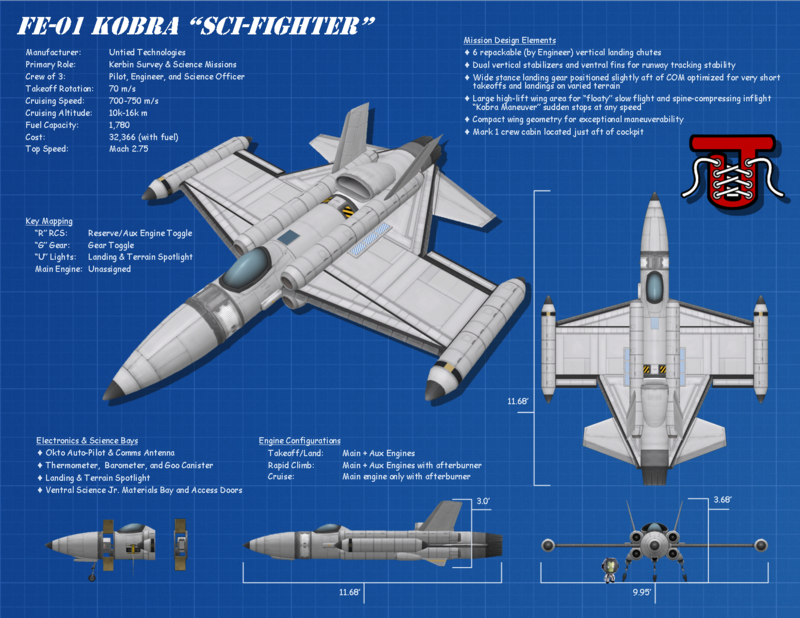 To share the obligatory example, this thing fits your bill, but only for the single pilot. Copy Mass/fuel/lift/TWR ratios, and you will get the exact same performance. Rune. Engineering is all about ratios. I have a light trainer aircraft you can use. Low tech and probably good range fully fueled. Gets upto 300 m/s and has broken 10 km but not sure what its useable ceiling is. 'As much fuel as you can carry' is a good recommendation, but the afterburning is not. Without it, and decent TWR, you can sustain Mach ~2 flight (~600m/s) surprisingly economically, if you are sufficiently streamlined. 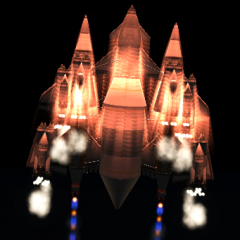 And remember, in KSP, 'streamlined' means there are no open attachment nodes, as few surface-attached things as possible outside of cargo bays, and everything ends in pointy things, both front and back. Rune, on that topic, how does this interact with drop tanks? Like, supplemental fuel tanks on decouples or pylons hanging from the wings or body, attached with fuel lines to the main fuselage, and dropping the dead weight of the containers after draining them. Kind of want to see what the balance is between the added drag and the added fuel, at least in the early part of the flight. Drop tanks are effective if done right. Let me go find one of my good ones. Ehhh cant find any stock ones. Anyway, if done right, ie with stage recovery installed and parachutes on the tanks, they can be super useful. Rune, on that topic, how﻿ does this interact with drop tanks? Like, supplemental fuel tanks on decouples or pylons hanging from the wings or body, attached with fuel lines to the main fuselage, and dropping the dead weight of the containers after draining them. Mmm... not really a fan of drop tanks. And not only because I am a fan of recovering everything! Basically, drop tanks are hard to make aerodinamically cheap (they would need the same lenght/diameter ratio as the main plane body to be similarly 'streamlined', and still it would add cross section to your plane). Besides, drop tanks are uneccessary. 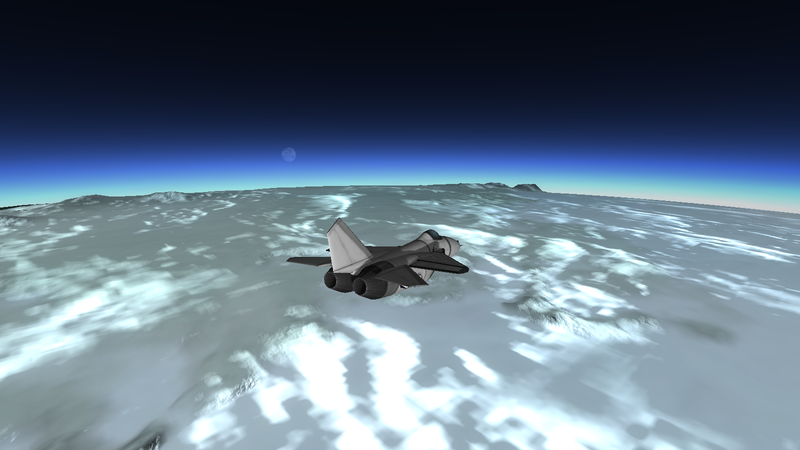 As in, you don't need drops tanks to make a plane capable of circumnavigating Kerbin. So why bother? Just make the plane slightly longer and it'll have a higher top speed than with drop tanks, since top speed is drag-limited, not mass-limited. Then again, different people come to different conclusions. Rune. If you like building them, you will figure out a way to justify them. Is there any 1.4.2 downloading file as I'm playing in that version of the game. That craft works in 1.4.... what did you try to do? If you open the craft file in the text editor... in the first or second line if code, just change the 1.4.3 to 1.4.2 hit save and it should work. If it doesn't work, yes I do have previous versions of all my KerbalX craft. Panther is perfectly fine. 'As much fuel as you can carry' is a good recommendation, but the afterburning is not. Without it, and decent TWR, you can sustain Mach ~2 flight (~600m/s) surprisingly economically, if you are sufficiently streamlined. Well, yea, you can supercruise with the panther around 600 m/s, but I'd think its easier for a newbie to just use the AB and carry more fuel. Also the afterburner is surprisingly economical as well. While it uses about 2x as much fuel to make the same amount of thrust, if you can get your drag losses per km down to half as much, it cancels out. In stock KSP the panther can get you high and fast enough that your drag savings will start to be significant (the whiplash is even better and more economical for very long distance travel, of course. The fuel consumption at high speed an altitude will drop precipitously as well as the engine's thrust drops. In the end you want to look at what speed you can sustain, divided by your fuel consumption, and the two modes can get very similar numbers, and both modes can be used for designs that can get plenty of range. The afterburning mode takes less player time, so I'd still say to go with that.